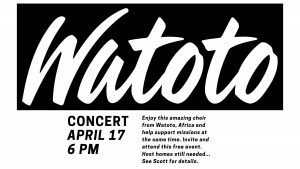 Please join us for an amazing night of worship with the Watoto Children’s Choir from Watoto Africa. This event is free and will featuire an amazing group of children who sing the gospel in a way that will touch your heart. Please come and be a part of their evangelistic efforts and share in a night you won’t soon forget!